There is a very theologically dangerous heresy that is epidemic in our churches these days, which claims that Christ's work of redemption was finished (or completed) on the cross at Calvary. The following Statement Of Faith is from the International Baptist Missions (IBM Global) website . . . I do not mean to be unkind, but all of IBM's missionaries are being corrupted by the heresy taught at home base. I DO agree with the rest of the preceding quote from IBM's website, but the first sentence is false teaching, and dangerous, because such teaching totally ignores, abandons and negates the entire book of Hebrews!!! I've heard many sincere preachers say that Christ's work was finished on the cross. That's simply not accurate. My intent in writing this article isn't to make enemies or hurt anyone's feelings or ministry; but rather, to straighten people out on this matter. Jesus' blood had to be applied to the Mercy Seat. It's a common error that I hear preachers make. It sounds good, but it's unscriptural. It may seem like a trifle matter of semantics, but it is far more serious, because it supports the bloodless theology of liberals like John MacArthur and R.B. Thieme, Jr. Redemption wasn't “finished” until Jesus' liquid blood was sprinkled upon the heavenly Mercy Seat. I do believe that preachers ought to give each other “room to swim” so-to-speak without devouring each other for every slight doctrinal variation; however, when it comes to critical matters such as repentance, faith, salvation and the blood of Jesus, then there's no room for error. Please understand that I'm not saying not to support IBM's missionaries, God forbid. They have some fine missionaries that I would support any day of the week (and we should generously support missionary work). I encourage people to support Baptist missionary boards, such as BIMI, IBM, et cetera. I prefer BIMI (Baptist International Missions, Inc.) simple because they are King James Bible ONLY and say so in their Statement Of Faith. Another thing that I think is important (that most mission boards don't) is the exclusive use of the trustworthy King James Bible. Truth has fallen in the streets in America, because we as Christians have adopted new and improved Bible versions (what a lie of the Devil) like the corrupt New International Version (NIV). The book of Hebrews plainly teaches that Jesus' blood is on the Mercy Seat in Heaven. It is difficult to grasp why so many preachers ignore the Scriptures of the book of Hebrews. Albeit, the reason why they do it is because they DON'T STUDY for themselves. Instead, they listen to radio and TV preachers and repeat the rubbish that they hear. This is the danger of Bible commentaries, that is, you might be misled and have a wrong mindset for years to come or the rest of your life, and mislead others too. What's the solution? We all should SEARCH THE SCRIPTURES (John 5:39) and as a general rule be leery of Bible commentaries, which are all authored by flawed, imperfect and mortal men; whereas the Bible is authored solely by our perfect God. We all learn and have to adjust our beliefs from time-to-time. I have done so on occasion . 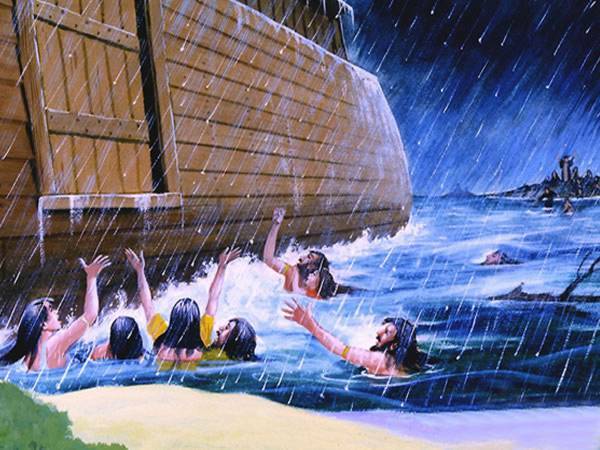 . .
For example: I used to believe and defend the heresy that dinosaurs lived with man in the time of Genesis, and that Noah left the dinosaurs behind. I was a big supporter of Dr. Kent Hovind (Creation Science Evangelism) years ago, who teaches a young earth view. There is no shame in admitting that you were wrong (even if you previously authored a book and no longer agree with your own previous teachings). I learned decades later from a dear man of God, Pastor Max D. Younce who shows Biblically that dinosaurs lived millions of years ago just as science evidences. Mankind is only 6,000 years old, but the earth is very old. This in no way supports the lies of evolution. Nothing, not the earth nor any species, ever evolved from a lower form of life (except maybe the evolutionists themselves ...lol). God created all things in the universe by the Word of His omnipotent mouth (2nd Peter 3:5; John 1:1-3,14). Only man was lovingly formed with God's very own hands. Isn't that beautiful! Also, I'm not saying that every presentation of the gospel must include mention of the heavenly Tabernacle, Holy Place and Mercy Seat. The gospel according to 1st Corinthians 15:1-4 is simply that Christ DIED, was BURIED and RESURRECTED after three days. A person doesn't have to be a theologian to get saved. I was gloriously saved at age 13 and didn't know that Jesus was God until I was 18 when I attended Bible college. Albeit, I accepted the Biblical teaching of Christ's deity immediately when someone showed me from the Bible that Jesus is God almighty! The same is true of Christ's virgin birth, substitutionary (vicarious) death, bodily resurrection, and the literal blood sacrifice of Jesus on the Mercy Seat in Heaven. What I am teaching concerning the literal, liquid, blood of Jesus being applied to the Mercy Seat in Heaven is not some strange or new doctrine; but rather, you can read some excellent doctrinal material authored by Martin R. DeHaan (1891-1965). See The Chemistry Of The Blood free online. The following is a direct quote from chapter 3 of CHEMISTRY OF THE BLOOD by Dr. DeHaan . . . Although the body of the Lord Jesus Christ lay in the tomb in death for three days and three nights, no corruption had set in for that body contained incorruptible blood. Lazarus being dead only one day more was said by his sister to be STINKING with corruption, but this one saw no corruption because the only cause of corruption, SINFUL BLOOD, was absent from His flesh. That blood, every drop of it, is still in existence. Maybe when the Priest ascended into heaven, He went like the High Priest of old into the Holy of Holies in the presence thereof God to sprinkle the blood upon the Mercy Seat in heaven of which the material Mercy Seat and Ark in the Tabernacle were merely copies. In Hebrews 9:23-26 we read. "It was therefore necessary that the "patterns of things in the heavens (referring to the earthly Tabernacle) should be purified with these (that is, the blood of beasts); but the heavenly things themselves with BETTER SACRIFICES THAN THESE. For Christ is not entered into the holy places made with hands, which are the figures of the true; but into heaven itself, now to appear in the presence of God for us: nor yet that he should offer himself often, as the High Priest entereth into the holy place every year with blood of others . . . but now once in the end of the age hath he appeared to PUT AWAY SIN by the sacrifice of himself." After Christ had made the atonement, He arose from the tomb, and then as the eternal High Priest, ascended into heaven to present the blood in the Holy of Holies where God dwells, and that blood is there today pleading for us and prevailing for us. The priest in the Tabernacle never spoke a word. All he did was PRESENT THE blood, and that was enough. Thank God for the faithful preachers of the Bible like M.R. DeHaan who rightly divide (dissect) the Word of truth. Beware of today's corrupt ministers who teach a bloodless theology, totally ignoring Christ's High Priestly work in Heaven by sprinkling His precious blood upon the Mercy Seat. The Lord was very concerned about the fulfillment of Old Testament prophecy concerning Himself. Jesus even said “I thirst” solely because He had read that prophecy concerning Himself in Psalms 69:21 from the Old Testament. Here it is again, “...THAT THE SCRIPTURE MIGHT BE FULFILLED, saith, I thirst.” Jesus said “I THIRST” so that the prophecy in Psalms 69:21 would be fulfilled. After Jesus made this final prophetic statement, KNOWING THAT ALL THINGS WERE NOW ACCOMPLISHED, He said IT IS FINISHED. What was finished? Everything that Jesus was supposed to do to fulfil the prophecies concerning Himself were completed, but this has absolutely nothing to do with finishing His work of redemption. To say that the basis of our salvation was finished on the cross at Calvary is to completely, ignorantly and horribly ignore, reject and leave off the book of HEBREWS (whose very theme is the blood sacrifice of Jesus Christ on the Mercy Seat in Heaven). Of all the books in the Word of God, only Hebrews does not inform us who the writer is, likely because the message of Hebrews is of such utter importance that God didn't want to detract from the message by telling us who the writer is. It Wasn't Finished Until Jesus' Blood Was Upon The Mercy Seat In Heaven! The all-important teaching and message of the book of Hebrews is that Jesus SPRINKLED HIS LITERAL, LIQUID, BLOOD upon the heavenly Mercy Seat. . . .
Notice very carefully that Hebrews 9:12 says Jesus obtained our “ETERNAL REDEMPTION” in “THE HOLY PLACE,” not on the cross! Clearly, the basis of our salvation was finished in the HOLY PLACE in Heaven, when Christ applied His literal, liquid, blood to the Mercy Seat in the presence of God the Father. Christ entered with His liquid blood “INTO HEAVEN ITSELF.” Why? We read, “TO APPEAR IN THE PRESENCE OF GOD FOR US.” Unlike the Old Testament high priest who had to enter into the holy of holies once every year with the blood of a slain lamb to atone for the sins of the people for another year, Jesus entered ONCE “BY HIS OWN BLOOD” into Heaven's Holy Place, to sprinkle His blood in the presence of God the Father, to put away sin by the sacrifice of Himself. Amen and amen! The Bible could not be any plainer on this matter. What has happened is that some wayward preachers who don't “SEARCH THE SCRIPTURES” as Jesus commanded in John 5:39 have propagated their heresies via radio and television, corrupting the world's churches. As America goes spiritually, so goes the world! America influences the world more than any other nation, whether it be good or bad influences. Sadly, the United States has become a terrible role model for the world to follow. We have become shameful and despicable as a people, both secularly and spiritually. I hope you will never forget the precious and important truth I have just shared with you. The Lord laid it upon my heart to warn others about this terrible false teaching that is epidemic in today's churches. If Christ completed everything necessary for our eternal redemption upon the cross of Calvary, then we might as well tear the book of Hebrews out of our Bible and burn it! We might as well ignore the Old Testament's teaching of the work of the tabernacle high priest who annually was required to sprinkle the blood a male lamb, without spot nor blemish, upon the mercy seat in the presence of God. All this was ceremonial law, a prototype of the genuine tabernacle, holy place, mercy seat and our dear High Priest (Hebrews 4:15-16; Romans 8:34) in Heaven. The death of the lamb wasn't enough. The pouring out of the lamb's blood wasn't enough. Likewise, Jesus dying upon the cross wasn't enough. The pouring out of Jesus' liquid blood wasn't enough. THE BLOOD HAD TO BE APPLIED TO THE MERCY SEAT IN HEAVEN IN THE PRESENCE OF THE FATHER FOR OUR SINS TO BE PUT AWAY!!! Thank God for the blood of Jesus on the Mercy Seat in Heaven. It was finished in Heaven, when Jesus ascended after His resurrection and “by his own blood he entered in once into the holy place, having obtained eternal redemption for us.” Thank you dear God for the gift of your precious Son Jesus Christ!